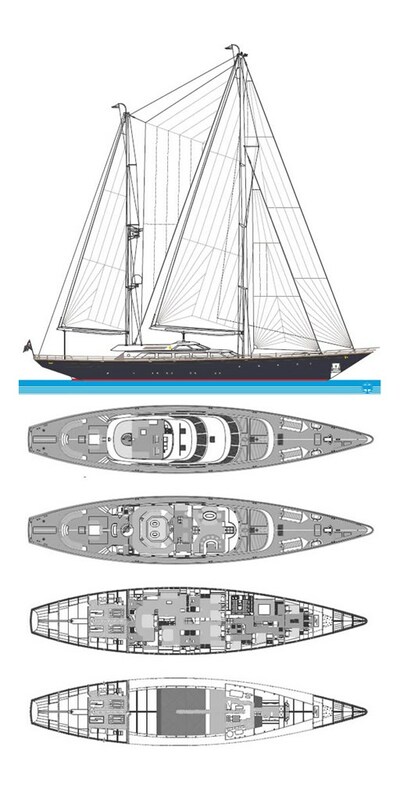 Second Perini Navi yacht for the legendary yachtsman Thomas J. Perkins, S/Y Andromeda La Dea was the second of the 46m series, but lengthened to 47m to accentuate the beauty of the traditional long counter stern that was typical of the original Perini Navi design. S/Y Andromeda La Dea sailed in every ocean of the world, East and West (from Hong Kong to the Galapagos), North and South (from Alaska to Antarctica) – completing three circumnavigations of the globe for three successive owners! Strikingly beautiful in blue and silver with dark red leather interiors and a wood-burning fireplace, it was Perini Navi’s ambassador flagship throughout the 1990s. Its adventures included a North Atlantic Passage during the prefect storm that became the subject of a bestselling book and a popular Hollywood blockbuster.